Artificial intelligence development firm Psibernetix, alongside researchers from the University of Cincinnati (UC) and the US Air Force Research Laboratory (AFRL), have developed an AI for piloting unmanned arial vehicles (UAVs) they say is doing for drone flight what IBM's Deep Blue did for chess. Dubbed ALPHA, the AI system has already bested expert pilots in air combat simulations, even when it is outnumbered and given handicaps like shorter-range missiles and a reduced payload. According to research detailed in the Journal of Defense Management, even at its current stage ALPHA is managing over 150 variables during a combat simulation, things like the position, velocity, and acceleration of all the air craft in the field, missile range data, visibility, and the number of shots taken by opponents. In the simulation ALPHA controlled a team of UAVs (the red team) against a “blue team” of human-controlled fighters. In each scenario ALPHA is given only limited knowledge of the opposing force (it doesn't even know the number of enemies it will face) and must rely on “organic sensors and situational awareness of the blue force,” according to the study. This sort of approach is necessary to take ALPHA beyond being just a difficult video game. The challenge for a system like ALPHA is it has to be able to respond when humans try to exploit it -- when they act like Maverick from Top Gun and try to do something crazy and unpredictable to beat the computer. 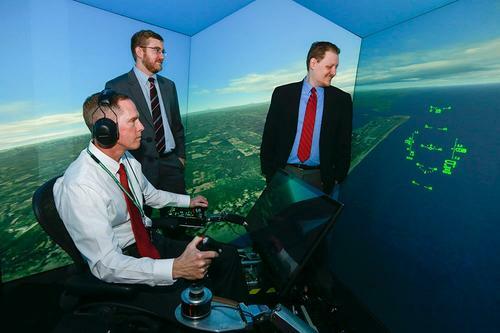 UC grad and Psibernetix President and CEO Nick Ernest (left) along with David Carroll of Psibernetix (right) watch as retired Air Force Colonel Gene Lee (seated) competes against ALPHA in a combat simulation. Perhaps what should worry pilots like Lee even more is that ALPHA is able to accomplish these tasks, something that one would expect would take a super computer, using only the processing power of a consumer-grade PC. While the version of ALPHA used in the study ran on a $500 PC, UC said the AI can operate on a platform as simple as a $35 Raspberry Pi. Will Robots Put You Out of a Job, Or Give You a New One? The goal was to create a system that reasoned and solved problems more in the way that humans do – by taking in lots of variables, but only considering those that are relevant to any given situation. Speaking with UC, Nick Ernest, president and CEO of Psibernetix, likened GFT to the way a football receiver might make decisions on the field. The receiver may have all sorts of knowledge on the stats of the cornerback covering him (number of tackles, fumbles, passes defended, ect.) but what it all could add up to is essentially that the cornerback is really good. Rather than getting overwhelmed with details, the receiver could take this knowledge, account for other, perhaps more important, variables (like relative speed and height), and act accordingly. Your opponent may be bigger and stronger, but perhaps you're faster and that's how you base your decision. GFT functions in this way, turning a complex challenge into a “tree” with branches that represent sub-decisions needed to solve the overall problem. Rather than thinking about how to win big picture, the system instead makes the best decisions for each smaller scenario on the way to victory. The researchers have said there's still work to be done with ALPHA before it will be considered complete. Though the system can currently make decisions in milliseconds, researchers believe the speed can be further optimized. “The human mind is an extremely powerful machine that will likely always have unbeatable performance in certain areas. However, the speeds at which ALPHA can intelligently operate serve as a distinct advantage within the context of air-to-air combat,” the study said. "Combining these strengths in a mixed manned and unmanned fighter squadron could prove to be an extremely effective fighting force. ALPHA controlled aircraft would happily volunteer to take risky tactics and have the manned craft perform safer support roles. Due to the transparency and linguistic nature of fuzzy logic, ALPHA would be an extremely easy AI to cooperate with and have as a teammate. ALPHA can continuously determine the optimal ways to perform tasks commanded by its manned wingmen, as well as provide tactical and situational advice to the rest of its flight." The study also notes that applications of GFT are not limited to aerial combat. The GFT methodology can be applied to any problem that has, “a need to be verified and validated for either safety or performance assurance, computational efficiency as to not require an entire computing cluster, [has] an inability to pre-script control due to uncertainties in the environment, or a requirement to be able to transparently monitor the system and its intent at all times.” Design automation, robot surgery, and cybersecurity are all considered potential future applications.